Basil, or Sweet Basil, is a culinary herb in the mint family (Lamiaceae). Its leaves have a sweet and pungent aroma. From the many varieties of Basil, Sweet Basil (Ocimum basilicum) is most often used in cooking, especially in Italian cuisine. Basil grows between 30–100 cm tall, with light green leaves and spike of white flowers. The green leaves of basil can be used both fresh and dry. Harvest the top most leaves first, before the plant begins flowering. Pinch out any flowers as they appear to encourage more leaf growth and to preserve the plant's flavor. To dry the plant, cut the stems at ground level and hang them up in a warm room. The dried herb loses most of its flavor, tastes and smells very different, similar to newly-mown hay. Several other basils are grown in India and different tropical regions of Asia, where this aromatic plant comes from. Holy basil (Ocimum tenuiflorum) or Tulsi is cultivated across South Asia as a medicinal plant and an herbal tea with many diverse healing properties. 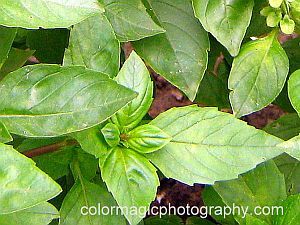 Lemon Basil (Ocimum × citriodorum), used in Indonesia, has a mild lemon flavor, very different from those of other varieties. 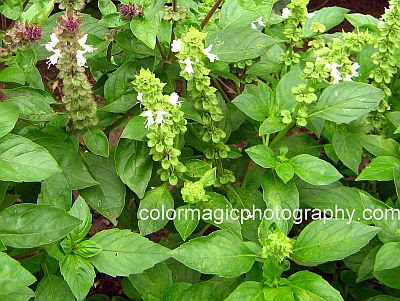 Several varieties of Thai basil (Ocimum tenuiflorum) are used in Thai cuisine. Most basil species are frost tender annuals. They will thrive outdoors all summer, in sunnier climates, but will die out in late autumn at first frost. If allowed to go to seed, they will come back next year. However, basil can be grow all year round indoors, in pots. In this case they need regular watering and much light, even fluorescent light will do. Like oregano, basil contain large amounts of (E)-beta-caryophyllene, which seams to be useful in the treatment of arthritis and inflammatory conditions of the colon and small intestine.